The sweet pea is a flowering plant, native to Sicily and Kathy Pickles has brought out their delicate nature in this pretty 'Sweet Peas' collection. Purple and red sweetpeas with green leaves cover this design. Kathy Pickles was born and brought up in London. After a Foundation Course at Canterbury College of Art and a short time studying textile design at Winchester School of Art, she went to Sussex University where she gained a degree in the History of Art. 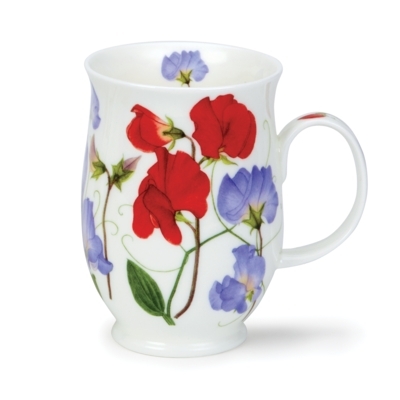 Since 1994 Kathy has been designing floral mugs for Dunoon Ceramics and to date has produced over one hundred and fifty designs.